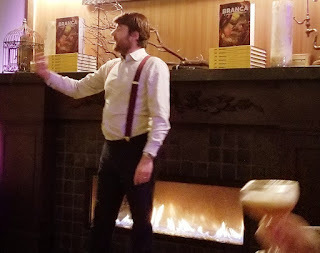 Vintage Fernet Branca Tasting... With Mr. Branca! If you're not familiar with Fernet Branca, it is an inky, delightfully bitter-tasting herbal liqueur. Fairly sweet, you could simplistically describe Fernet's flavor as medicinal, but there is a lot more going on than that. There is a whole class of these digestive liqueurs that in Italy are called "amari" -- singular "amaro" -- which appropriately means "bitter". But the concept is not unique to Italy. I have been obsessed with these things since I first tasted Unicum during a trip to Hungary in 1990, then I found out about Gammel Dansk (Denmark) and Rigas Black Balsams (Latvia) before I made my way to amari like Fernet Branca. 1970's Fernet: Maybe stronger than today's 78 proof? Serious echinacea bitterness, but a very long finish, with flavors developing on the tongue long after swallowing. 1980's Fernet: More of a chocolate bitterness in this one. A little dusty in the beginning, with aromatic cedar notes. 2017 Fernet: Mintier, fresher tasting than the older ones. A little cola-like effervescence on the tongue. Three cocktails containing Fernet Branca were also shown off at the event. Personally, I find that a little sacreligious. Here is a complex herbal recipe with 150 years of history, why are you burying its flavors under a bunch of other stuff? I asked Edoardo Branca about that, and he said reasonably enough that he doesn't object to someone drinking Fernet however they care to do it, though personally he prefers it either straight up or in a caffè corretto -- espresso with a shot of amaro in it. He had a good story about his grandfather, Pierluigi Branca. That gentleman also disapproved of mixing Fernet Branca, and didn't hesitate to chastise anyone he saw adulterating it with anything. In 1955 or 1956, he happened to be in Cannes for the film festival, and in a hotel bar he overheard the revered opera singer Maria Callas as she ordered a Fernet Branca with sugar and mint added. As he shouted his disapproval at her, his wife (Edoarado's grandmother) started shouting back at him, "You don't behave like this!". Edoardo didn't say what Ms. Callas' reaction was, but family legend credits the encounter as the inspiration for the milder, mintier Branca Menta liqueur. The cocktails we had that night did not do much to change my mind about the impropriety of diluting your Fernet. 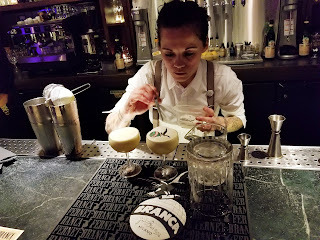 In the picture at left, the bartender is making a complicated drink called The Italian Icon, with Fernet, Carpano, rum, and egg white, cleverly finished off with a disk of rice paper bearing the Branca logo. It seemed like a lot of trouble, especially since hardly any herbal flavor at all remained in the finished product. Somewhat more to my liking was the Shakerato -- Fernet, cold brew coffee, coffee liqueur, and cream. The best cocktail served at the event was the Toronto -- basically a Manhattan with Fernet Branca instead of vermouth. The herbal liqueur played well with the bite of rye whisky. If you're interested, this article has the recipes for the Toronto, Shakerato, and a couple of other Fernet cocktails. One more point about mixing Fernet. The biggest market for Fernet Branca outside of Italy is Argentina, where Fernet con Coca -- Fernet mixed with Coca-Cola -- is something like the national drink. 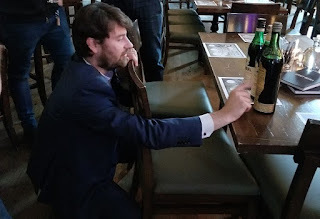 That is also the only other country where the company produces Fernet Branca, and it is made a little stronger there, 86 proof instead of the 78 proof version made in Italy -- be sure and bring back a couple of bottles next time you find yourself in Buenos Aires. Fernet Branca is aged in oak barrels for a year. Since breweries these days are always looking for unique barrels to age beer in, I asked Edoardo if they ever sold their used barrels to anyone to make funky beer with. He gave me a funny look and a curt "no". Later I realized that a lot of their aging is done in barrels as large as 17,000 liters, so it's not like the whisky model where a lot of small barrels are used once or twice and then passed on. No wonder he thought it was a strange question. I did enjoy a very interesting Odell Brewing Fernet-aged Porter a few years ago, but those barrels were from a Colorado distillery. Here's another take on the Portland event, with a lot of nice photos. Many thanks to Edoardo Branca for visiting us in Portland. The vertical tasting was something I never would have expected to experience, and it was great to hear his personal insights about a classic drink.